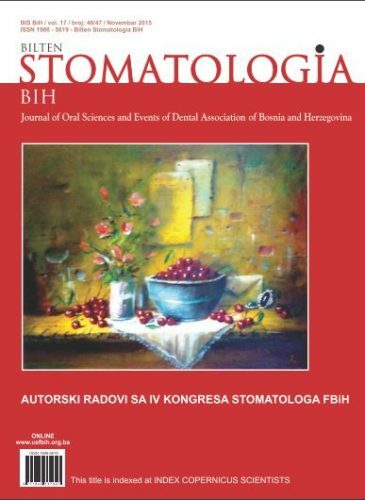 Stomatological Review is a non-profit scientific journal that publishes original scientific paper, case reports, letters to the editor, contemporary perspectives, editorials, preliminary communications in the field of dentistry and other biomedical sciences. The works are in Bosnian / Croatian / Serbian language with the title, summary and key words in B/C/S language and English. Works can be used for educational purposes without prior authorization but the source must be specify. The use of whole or parts of articles for commercial purposes is strictly prohibited without written permission of the publisher. The journal is in open access. Entire content is available without any special payment to all users or their institutions. Users are allowed to read, download, copy, print, search or link all full text of articles published in the journal without asking prior consent of the publisher. Copyright: Faculty of Dentistry with Clinics .